In the July “Play with Your Food” column in BRAVA we took a look at the perfect picnic through the eyes of Sami Fgaier, owner of Le Personal Chef. 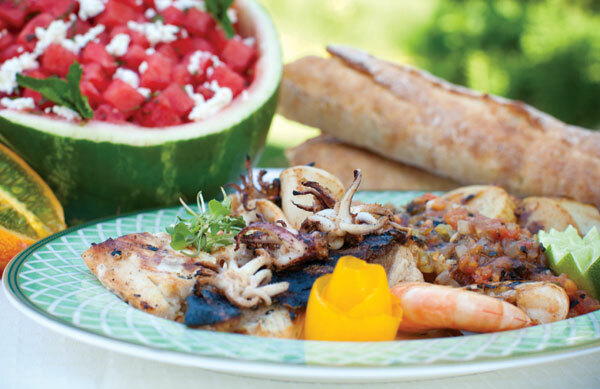 Here are two of Chef Sami’s better recipes for outdoor dining enjoyment. Add shrimp and pearl onions to mix, cover with plastic and refrigerate for 2 hours. Make skewers with shrimp, white pearl onions and fig. Make sure they are pushed well together so they can hold well on the grill. Drizzle with honey lemon dressing, enjoy! Grill tomatoes, red onions, peppers and garlic for about 8 minutes on each side. Cooking time might be different for different vegetable. Remove vegetables from grill. Put aside in a bowl and cover right away with lid or aluminum foil to retain the heat. Covering the vegetables will also allow the skin to come off easily. Remove skin from onion, tomato and pepper. Pull out the garlic from the head of garlic. It should come out easy and should be soft like a spread. Cut all vegetable concassee (rough chop), add olive oil and sea salt. Put in fridge for about an hour to cool. Serve on a platter, garnish with sprigs of Italian flat leaf parsley.